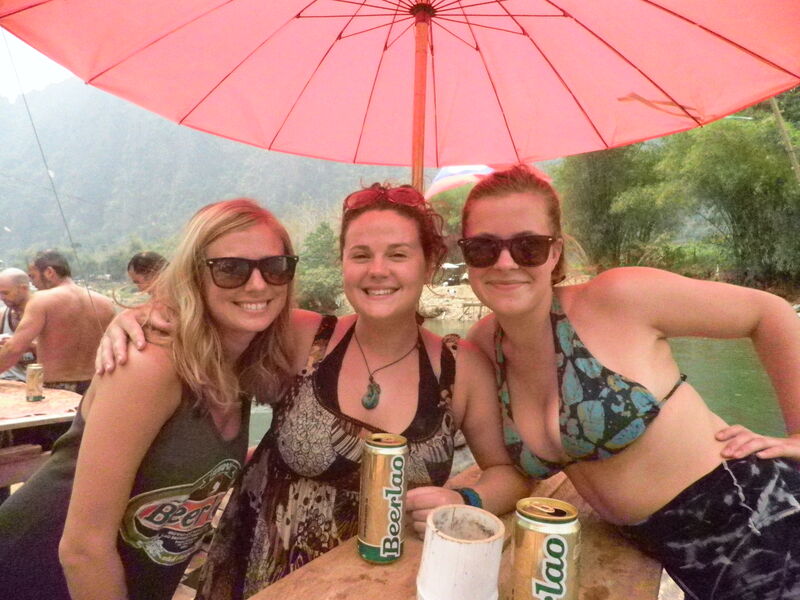 After our nice relaxing time in Luang Probang, Kim, Megan and I moved on to the infamous party town of Vang Vieng. 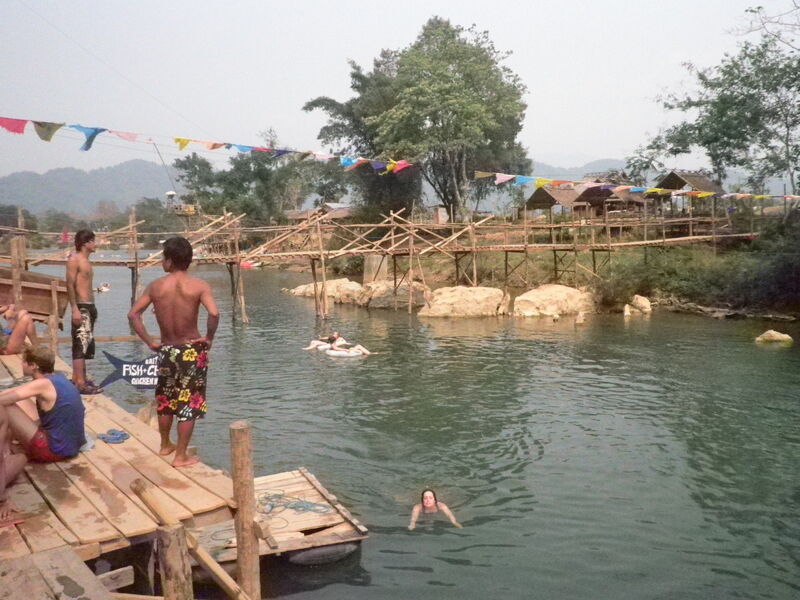 The main (and almost only) attraction here is tubing down the Nam Song River. Now, many of you may know that most people from Texas are experts at tubing. We take numerous trips down the Guadalupe or Comal River in New Braunfels every summer. 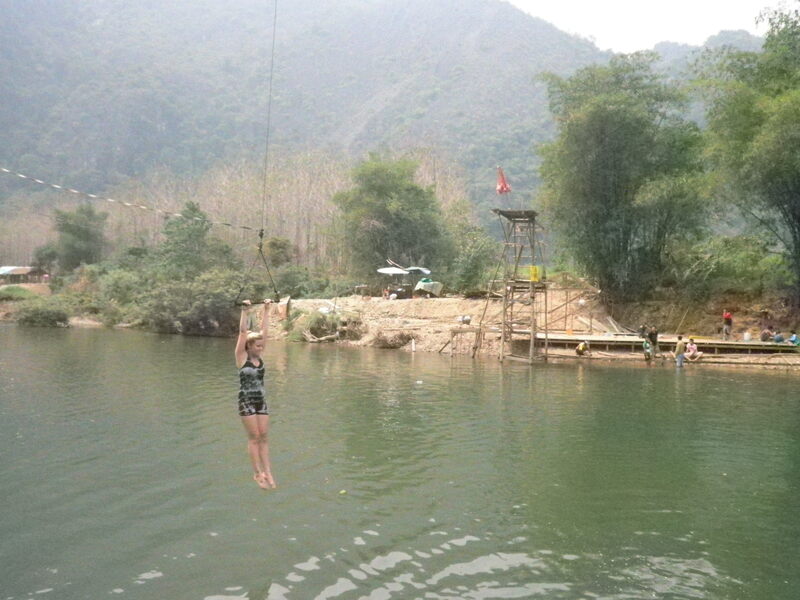 But here in Laos, its done a little differently. Instead of packing up your own ice chest full of booze and attaching it to your tube, the river is actually lined with tons of bars for you to stop at and quench your thirst. On to the next bar. Mud volleyball!! I’m always game for a good volleyball match so I was so excited to try out this new twist to an old fave. It was awesome. Not so much the game itself, just everyone falling all over the place trying to hit the ball! It was quite difficult…one guy even suggested that we move over to another court without mud so we could play an actual game when one of the girls shouted “its not about the game, its about the MUD! !” I completely agreed. It soon turned into everyone just running around and wrestling, completely covered. Good times. We moved on to the next bar for some snacks and more beer. Kim and I actually went down of of the slides! It was pretty small, but fun…nothing like the “death slide” two bars down, where one person a year actually dies…crazy. A friend of ours went down it and said it was one of the scariest things she’s ever done. No thanks. Are we getting old? After you get through all the madness, the rest of the float is amazing. You are surrounded by beautiful mountains and lush green landscape. Since most people don’t make it past the first few bars, it’s extremely peaceful and quiet towards the end. Of course there is one last bar to stop at before you get out and catch a tuk tuk back to town. 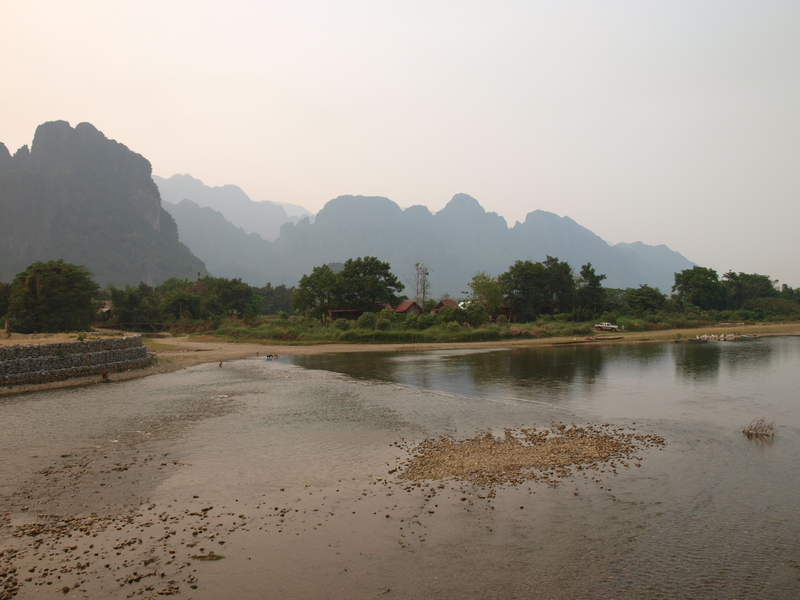 When you aren’t tubing in Vang Vieng, everyone lies around all day at the restaruants equipped with cushion-lined tables and tons of TV’s showing Friends, The Simpsons or Family Guy. I love Friends, but not sure that I can watch another episode for a while. Still love me some Family Guy. At night, everyone heads down to another part of the river lined with bars and restaurants. Most of them are blaring techno or rock music til the wee morning hours. We spent a night or two down there and enjoyed some of the best drunkin’ dancing that Kim and I have ever seen. Boys dancing on poles (yes, boys), some had pre-choreographed routines….we were speachless and almost wet our pants from laughing! We were lucky to find a bar a little more our style that we hung out at most nights with our new friends. After taking a chill day, we all decided to hit the river again. However, I came down with some kind of stomach “bug” and actually had to take a trip to a Lao hospital. Um..yeah…not good. It was super filthy and well, just plain scary. Luckily, they just checked my vitals and prescribed me some medicine and sent me home. I’m so glad whatever they game me worked, because there was no way in hell I was getting admitted into that place! Kim and Megan had a relaxing day on the river while I slept off my bug at the hostel. After a couple more chill days and one more crazy day on the river, Kim and I needed a change of pace (and some exercise). We decided to rent bicycles and take a ride through the surrounding villages over to the Blue Lagoon, a small natural pool about 7km out of town. The scenery was incredible and other than the fact that we rented cruisers instead of mountain bikes, it was a great trip. But yeah, cruisers with crappy breaks on unpaved roads were not the best choice. Kim actually thought she was going to die flying down some of the hills! 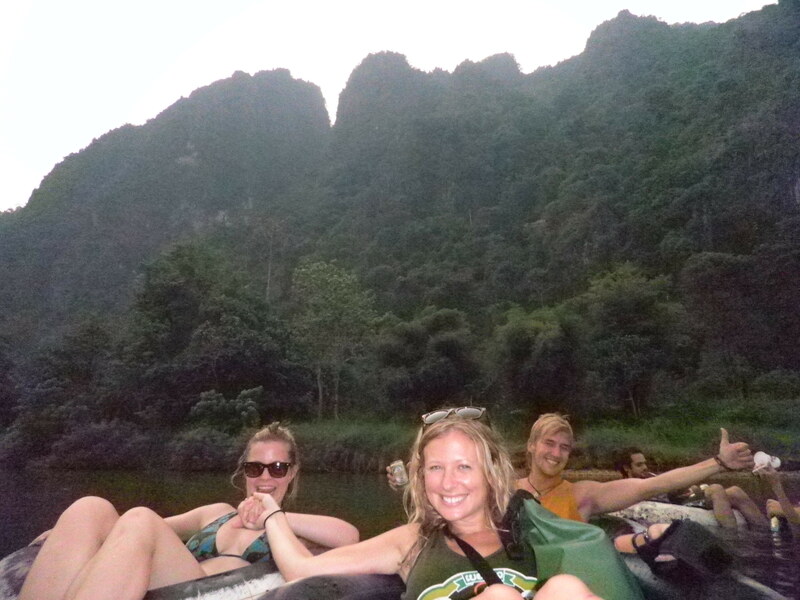 Vang Vieng is definitely a backpackers paradise. I think Kim and I may have been two of the oldest people in the town, but we had a blast pretending to be 21 again. We had to say goodbye to Megan, who has invited us to visit her in Denmark in June–can’t wait! We then headed off to Vientiene, the captiol of Laos and a former French colony. We spent two days here wandering around the city, checking out the temples and eating delicious food. 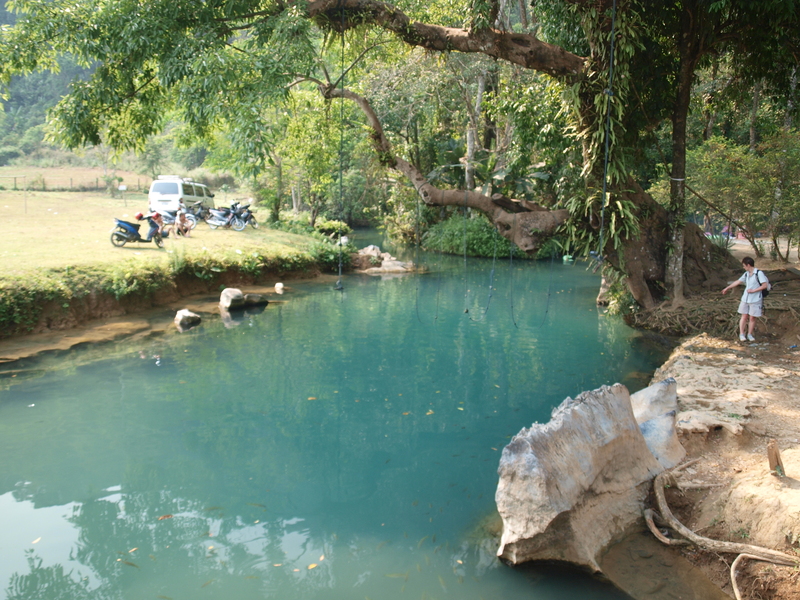 It’s definitely the most developed place we went to in Laos. After our time here, we took an overnight train back to Bangkok to catch our flights to Nepal. 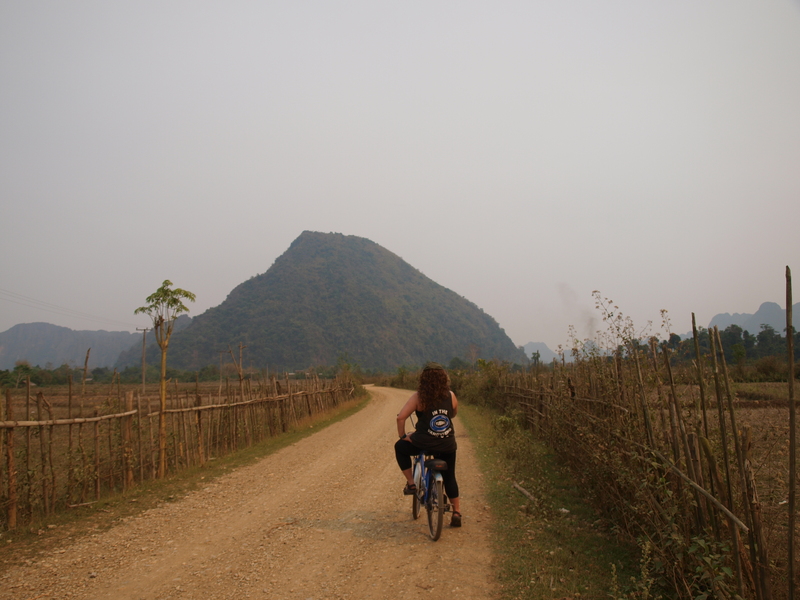 Laos exceeded our expectations big time. We really loved it here and it will be missed. Now, time for some trekking in the Himilayas!! !